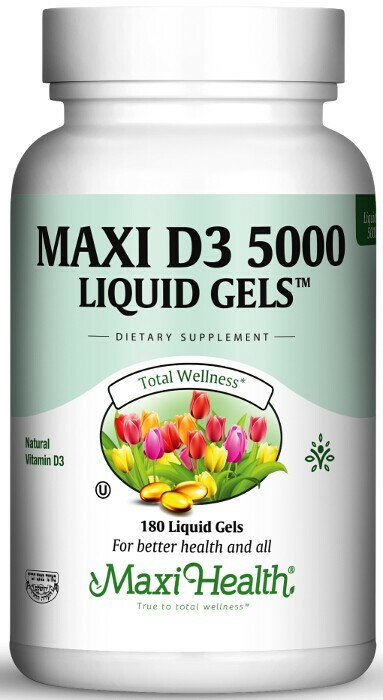 Our new Maxi D3 5000 Liquid Gels™ are your logical source for supplemental vitamin D. Liquid filled soft gels offer you faster release and are a desirable alternative for those who have trouble swallowing tablets and capsules. Maxi D3 5000 Liquid Gels™ are made with 5000 IU of vitamin D3, the most absorbable form of vitamin D known as cholecalciferol. That’s why you want vitamin D3 rather than any other. Try our new Maxi D3 5000 Liquid Gels™ to support your health. This product contains NO soy, wheat, gluten, sale, fish, milk, artificial flavors, colorings or preservatives.